Today Squeaky Books is featuring Kathy from I am a Reader, not a Writer. Kathy has donated a copy of Pittacus Lore's new book I am Number Four. This one is on my wishlist. And let me tell you, it has been SO HARD for me to resist reading it while it's been sitting in the giveaway pile. Ah! Anyway. Even though Kathy INSISTED she was not a writer, I got her to write a guest post. And I think it's pretty good. Check it out, and then check out the giveaway! Although I love browsing our local Barnes and Noble, I would definitely pick an indie bookstore. For your birthday you are given a bookstore. This could be an indie bookstore, or an entire chain like Borders/Barnes and Noble. Who do you choose and why? Just two blocks from the home I grew up in is a quaint little street called Honolulu Ave. Growing up we always referred to it as the “Cute Street”. After school, we would often jump on our bikes and pedal uphill to the “Cute Street” to buy ice cream or candy at the drug store. On the corner stood a small children’s bookstore called Once Upon A Time. I loved to park my bike and wander through the shelves looking at all the beautiful books. As a teenager, I was hired to work in the bookstore after school. What a dream job! A job I would love to have again someday. 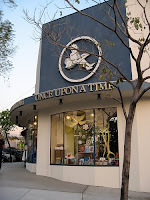 Once Upon A Time housed not only books but also small gift items that went with books. From stuffed animals to bookmarks, knick-knacks to games and toys, you could find oodles of whimsical book related treasures on the shelves of the store. You have never seen window display as delightful as what you would find at in the windows at Once Upon A Time. There is something so charming about the feel of a small town store. I am always nostalgic for my childhood when I enter an indie bookstore. Given the option, I would choose to have a small independent children’s bookstore. You guys get a chance to win a nice, brand new (and not read by me, I promise), hardcover edition of I Am Number Four by Pittacus Lore. Did you guys know this book is ALREADY being made into a movie? And it was JUST released! Crazy. This giveaway is just like the others. Ya gotta head on over to Kathy's blog to enter (link below). Bonus entries for following me and/or her. Go on! Get to it! Thanks for letting me host a giveaway!